Luxor City has unique characteristics, which makes it special in the whole world. It gathers the past and the present at the same time. There is no monument in Luxor that doesn’t talk about the ancient Egyptians. Luxor is located in the Nile Valley in the southern part of Egypt. It is built on and around the ancient site of Thebes, which was the great dynastic and religious capital of Egypt during the Middle Kingdom and the New Kingdom. Thebes lay on either side of the Nile River. It was Homer who used the word ‘Thebes’, to indicate the ancient capital of Egypt. Originally it was called ‘Waset’, the city of the was sceptre, like the 4th Nome in Upper Egypt during that time of which it was a part. The rise of Thebes began in the Middle Kingdom, around 2056 BCE, but the city only became the capital of Egypt after the Hyksos invaders were driven out of the country at the beginning of the New Kingdom in 1550 BCE. The chef Theban deity was Amun: ‘He who is hidden.’ Amun, the supreme Sun God and father was part of the Theban triad, together with his wife Mut, the mother (represented in the form of a vulture or a lion) and son Khonsu, the lunar son of the couple. The remains of ancient Thebes constitute one of the largest and most remarkable archaeological sites in the world. It has made the Luxor area a tourist destination since the beginning of tourism. Even in ancient times the area drew tourists, so, you won’t be the first one. From vast temples to open-air museum and from vast desert region to exotic beauty of river, it makes this city a major sight seeing of Egypt. There are so many splendid temples and monuments to visit you will have to be picky if you don’t want to get ‘templed out’. Luxor has actually three separate areas, each with their own highlights. 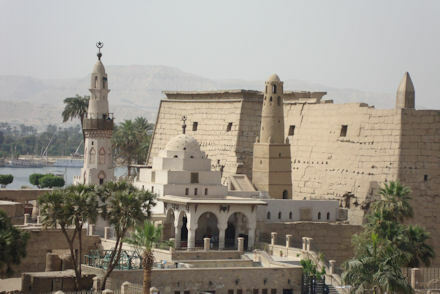 The primary sightseeing sites of the city are not located in the city itself but across the Nile on the east bank and the west bank and in Karnak.